Decide if you want information from the entire community or only information from a place to show up in your tile. 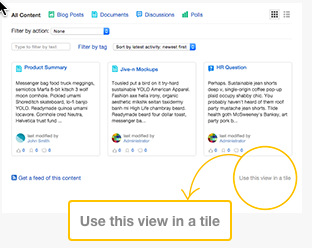 If you want to see place content only in your super list then browse to the place, and select Content. If you want to see people, places, or content across the entire community, then append your community name with /people, /places, or /content. Filter and sort results that you want to see in the super list. Copy the URL from the browser or click Use this view in a tile > Copy to clipboard. In either a wide or narrow tile, click Add a tile. Select Lists - Dynamic > Super List. Paste the link into the Paste filter link here box. Detailed list Use this view to show title, snippet of content, and, if available, number of comments, replies, likes, and views. You can change the title and the number of items to display. Click Apply to save the tile settings. Click Save to save the page changes. A Super List tile is added to your place.